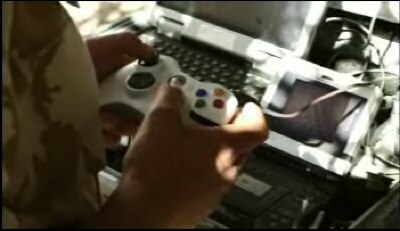 We've seenz video games infiltrate the armed forces before, be it a Microsoft controller used to pilot a bomb squad robot or Unmanned Aerial Vehicle (as seen above), games used as recruitment tools, and even games as training simulators. Soon, we may get a taste of commercialized simulators that are being developed by defense contractors, not completely unlike how America's Army came about. Budd McLaughlin - Business Editor for the Huntsville Times and uncle of yours truly - posted an interview with Camber Corporation's director of research and engineering Jerry Hendrix about Checkpoint Recon, a simulator developed in cooperation with the U.S. Department of Defense to teach soldiers the rules of engagement in different situations and theaters of war. The military training game is one of 12 finalists in the 2009 I/ITSEC Serious Games Showcase and Challenge. The contest recognizes outstanding use of video games for non-entertainment, training applications. I/ITSEC (Interservice/Industry Training, Simulation and Education Conference) promotes cooperation among the government, industry and education in improved training and education programs, identification of common training issues and development of multiservice programs. It's important to note that the Serious Games Showcase and Challenge is sponsored by HP, DeVry University, and Crytek (among others). The game rewards the correct decision, which, unlike entertainment games, is sometimes a no-shoot decision. Using video games for training makes sense, Hendrix said, since the soldiers have grown up playing video games. "You never know how popular things become," Hendrix said. "We had young gamers try it out and they were very excited. "We would welcome the opportunity to meet with a (game) publisher." Huntsville, AL- Nov. 17, 2009 – Camber Corporation, provider of cyber security, subject matter experts, engineering solutions, acquisition management, full-service education, and training to defense audiences worldwide, has announced that its Checkpoint Recon™ military training game will be one of just 12 finalists in the 2009 IITSEC Serious Games Showcase and Challenge. The contest recognizes outstanding use of video games for non-entertainment, training applications. Checkpoint Recon™ is a classroom level, Rules of Engagement (ROE) familiarization training game. The backdrop of the game is a fictitious city, where players roam freely in an Apache helicopter. As players manuever through the airspace, they encounter activity hotspots that capture their attention. Each acitivity spot is a scripted scenario, with an engagement rule to follow. These sophisticated scenarios are created to represent the spectrum of encounters that an Apache crew might have to face. In the simplest scenario, for instance, a player may have to confront a non-player character (NPC) with obviously hostile behavior. The player must then follow representative ROE guidelines to register his decision to shoot or not-shoot. But other times, the player may face more subtlety, by coming into contact with an NPC who has uncertain motives. In this scenario, the player is required to exercise “tactical patience” in order to assess the behavior, location, and objects possessed by the NPC, and mark their observations. The game rewards the correct decision, which, contrary to entertainment games, is sometimes a no-shoot decision. The game was developed entirely under a Camber Information Technology Division IR&D program for application of commercial game technology. Camber Corporation provides professional engineering and technical services to the Department of Defense and other government agencies at over 100 locations worldwide. Our key focus areas include Information Technology, Homeland Security, Cyber security, Chemical and Biological support, Training and Education, Decision Support Systems, Modeling and Simulation, Systems Engineering, and Software Engineering. We provide simulation based tools and services for training, mission planning, rehearsal, after action reviews, virtual reality command and control, and engineering analysis. Our service network touches important defense interests in every Joint combatant command; over 150 Army, Air Force, and Navy programs; National Guard headquarters in every state and territory; and over 25 NATO or coalition countries in Europe, Asia, and Africa. We have deep relationships with industry partners and equally strong records of mission system collaboration and teamwork. Page created in 0.7535 seconds.